Distractions can be a nice diversion to help us relax, reset our minds and souls, and allow us to come back refreshed. This is what we tell ourselves when we are 3 hours into a mindless binge of plane crash complications on YouTube, Facebook friend photos of their 14 year-olds’ first day at school (Seriously? ), and seemingly harmless scanning of news headlines. Not that I have ever done anything like that. Nope. Actually, I have never taken a photo of my children on their first day of school and posted it in Facebook. The way I see it, you can do that once. On their first day of pre-school; the actual first day of school. Ever. 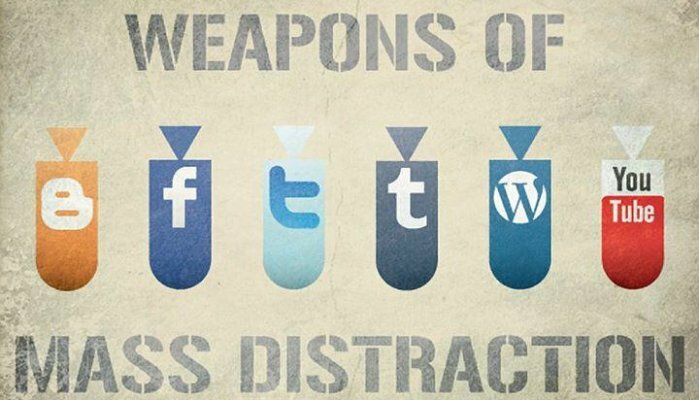 Distractions, we say, can be a good diversion. After all, it is important to have a good weekend off to come back to work on Monday fresh. Endurance athletes need rest and recovery days to allow their bodies to build back up and be strong for another hard workout. Vacations are important too for all the reasons said, written, and experienced by many. But we delude ourselves to think that distractions are a good diversion. Distractions are holding us back. OK, I will not speak for you. Distractions are holding me back. I have been thinking a lot about distractions lately. Whenever I un-purposefully swipe through the screens on my phone or watch another video of Keith Richards playing 30-20 Blues (C’mon, this is OK, right? ), or refresh by Twitter timeline for no specific reason, I think to myself, “What am I doing? This is pointless." Nir Eyal is right. I’m hooked. But don’t try to tell me I’m hooked. If you tell me that, I will get defensive and deny all charges. At the very least, I will think less of you for pointing it out. At the most, I will accuse you of being distracted and point out, without conscience or mercy or regard for your self esteem, that your distractions were the reason you ruined your relationship with that certain someone, whoever that is. I’ll think of someone. And don’t come over to my house with my wife and my mom and my best friend from college to conduct an intervention. I will probably just take a photo of you all and post it to my Facebook page, “Look. My first intervention." No. Don’t do it. It will not work. These are things people need to figure out for themselves. As I have thought more consciously about distractions in my life, three small, independent, but significant events that occurred this month, have come together in a series of signs of sorts telling me to sweetly that I must pay attention to distractions and try to stop them when I see them. On The Lede podcast, John Carlton, a legendary copywriter, told a story about how he started out in copywriting. When he started getting writing assignments he had nothing to fall back on, so he says he wrote “like there was a gun to his head.” He clarified saying, “This has to work.” He wrote with a focus on creating something as good as he could, not doing anything fancy or risky just focusing on the basic principles of good copywriting. In other words, he did not allow himself to get distracted by shiny objects. What he meant is that in these acquisitions, he used his own money. He is not using bank loans or investor money, but his own money from the business and in some cases, equity from his home. Talk about an event that drives focus. With a future on the line like this, one would not easily get distracted by too much idleness. On a recent Showrunner Podcast (I’m sorry, I cannot remember the one it was), the guest describes an opportunity about creating a course about running a podcast. The idea came from Brian Clark, the founder of Copyblogger. It was an opportunity the guest knew he could not pass up. He did not know how he would do it, but he knew he had to do it. Rather than say, as most of us would do, “That’s a cool idea. Maybe I should do it?” He called Brian back, got an introduction to his friend, and started making it happen that day. He did not allow himself to get distracted by fear or research or even his Facebook feed, all which would be excuses for inaction. In each of these stories, distractions would be the reason for inaction at the very least and a person’s downfall at the most. It is scary to think what these people who not have produced had they allowed themselves to get distracted. That is what I think about often. I am now way more conscious of distractions in my life and the concept of urgency and action. Every day, I fight the distraction demons so I can do the things I really want to do. Some days are better than others.